Improve your climbing skills and discover the beauty of the island of Cyprus in this rock climbing trip with Kyriakos, an IFMGA certified mountain guide. If you want to combine climbing with some relaxed time and sightseeing around a beautiful island, this rock climbing trip in Cyprus is your best choice! Lying in the east of the Mediterranean Sea and to the south of Turkey, Cyprus is one of the largest islands in the Mediterranean, after Sardinia and Sicily. Nested in a beautiful natural environment, it also has a rich history and culture. Here you can climb on different terrains. There are limestone and sandstone crags directly on the sea, as well as volcanic cliffs high up on the mountain. I propose a 1 week programme, tailored according to your expectations and your experience. If you’d like to improve your climbing skills, we’ll work on your technique and how to fall. Besides, you’ll learn how to prepare physically and mentally for difficult climbs. You can join this trip between April and June and between October and November. To reach Cyprus, you can fly into one of the 2 international airports in the country: Larnaca or Paphos. Sounds like a great trip? It is! Contact me and we’ll start planning for an amazing rock climbing week in Cyprus. 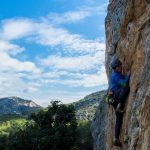 If you like to explore different places around the country while enjoying rock climbing in some selected spots, you should take a look at this Cyprus climbing road trip. Cyprus. Fly into one of the two international airports (Larnaca, Paphos). In different apartments near the climbing spots or in campsites. (I can provide tents and sleeping bags for 5 euros per person per nigh). 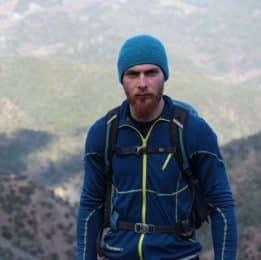 I am an IFMGA mountain guide living in Cyprus. I have a passion for exploring the mountains since I was child. Kyperounda, the town where I was born and raised, was my first playground, the place where I started practising different outdoor activities. First I learnt skiing. Then, I started training and taking part in races and competitions, traveling extensively in Europe. As I am very curious, I kept trying all kinds of sports until I discovered climbing and all its exciting possibilities. I also developed both my academic and my practical skills in the university, where I studied Outdoor Studies and Sport Science. During that time, I obtained qualifications as a Mountain Leader and a Climber. Teaching other people is one of the things I like the most. I find a deep joy in helping others to enjoy the mountains as much as I do. The experience of all these years as well as my technical skills, have taken me closer to my goal: becoming an IFMGA mountain guide. friendly, helpful and extremely professional. We really felt that we were being looked after by one of the best. Kyriakos also shared his knowledge of the route, the mountains and he even gave us some tips to improve our skiing. An absolutely fantastic experience that we will never forget. helpful and extremely professional. We really felt that we were being looked after by one of the best. Kyriakos also shared his knowledge of the route, the mountains and he even gave us some tips to improve our skiing. An absolutely fantastic experience that we will never forget. Is the best guide I have ever had the pleasure of climbing with. If you’re determined to climb Mont Blanc Kyriakos and his amiable personality will ensure you have fun on the way to the summit! I will seek his services in the future for other climbs around the world. ice and snow with excellent access. Highly recommended! !